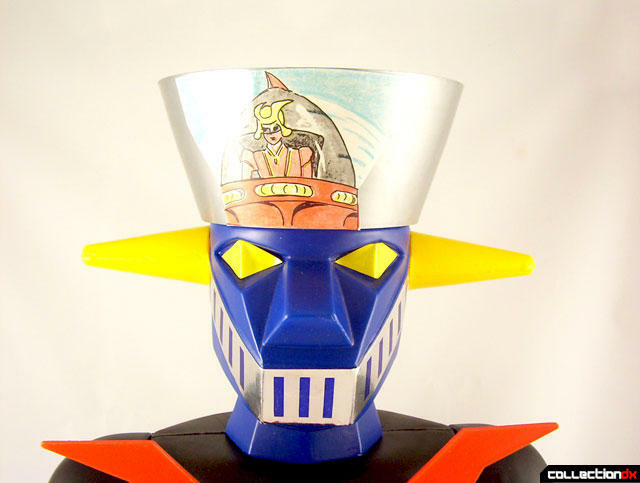 People are really divided on the Ring Toss Mazinga. Some collectors hate it, condemning it as nothing more than a horrid, blasphemous joke of a beloved character. Others can't help but smile when looking at it. This thing looks like it was designed by pre-schoolers! And since we're talking about a toy, isn't there a certain charm in that? A silly as it looks, at least that part of the toy is accurate to the show. The stickers on the arms, legs and waist are completely made up, just random shapes and colors stuck on there for no particular reason. Adding even more childlike quality to the toy is that the white stickers on the arms and legs are just plain old paper on the outside, not glossy at all. Very simple. The yellow of the eyes are stickers. Also, instead of going through the trouble of casting the chest emblem in two separate pieces of plastic, they just made on big piece and slapped a black sticker down the middle! Another inaccurate part of the toy is that it comes with a sword that can be placed in the right hand. 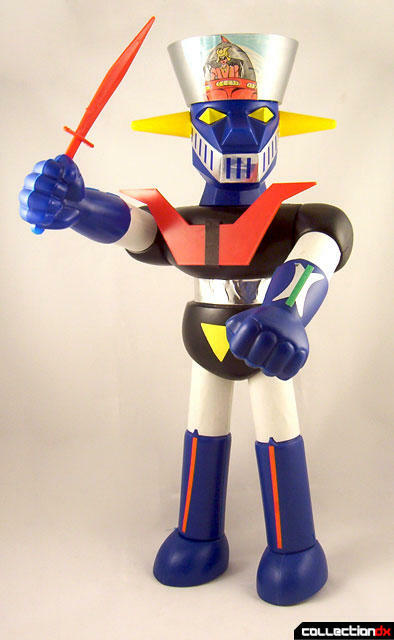 Mazinger Z had no such sword. The hand actually features a small hollow protrusion on the bottom so that you can fit the end of the sword into, holding the sword steady. hollow and you can toss 4 included balls in for further play value! Strangely, although there are 4 rings and 4 balls, the colors do not match up. 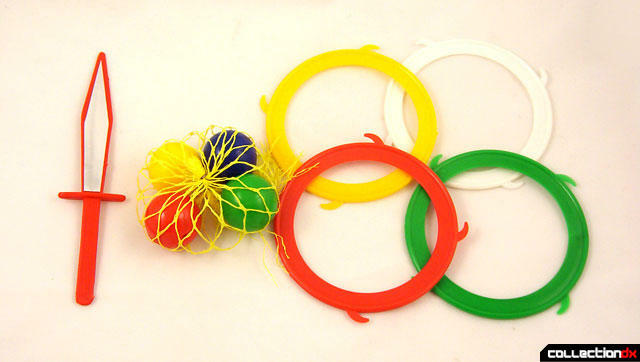 The rings are red, green, yellow and white, while the balls are red, green, yellow and blue. logo). It stands approximately 22" tall and is made entirely of polyethylene. The head is not vinyl like most jumbos. It is fully licensed by TOei Animation/Dynamic Productions. You can probably guess that I'm in the group who really digs this toy. It simply exudes FUNK. Auction appearances of this toy seem to come in spurts. You won't see one for a long time, then there'll be three in a week. It's strange. Hi, I'm from Italy and I'm quite sure the manufacturer brand name was Marel. Btw, I love the toy.